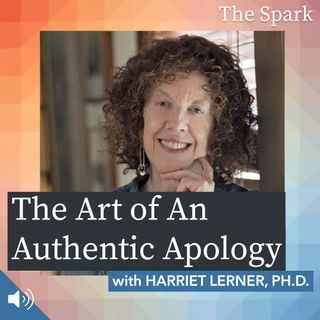 The Spark 022: The Art of An Authentic Apology with Harriet Lerner, Ph.D.
How do we say “I’m sorry?” A true apology goes beyond words and includes our behavior, and our ability to express empathy and connect with one another. There actually is an art to apology; a way we can own our own behavior and express our apologies in ways that go beyond just remedy the situation, they actually help us heal one another. Join us for this episode of The Spark, where our guest will be psychologist and New York Times bestselling author Harriet Lerner, Ph.D., as she teaches us ... See More the subtleties of the art of speaking an authentic apology and helps us define a new framework for forgiveness. Hosted by Stephanie James. Produced by Chris Lanphear for NoCo Media, Ltd. The Spark With Stephanie James is supported by its listeners, and by Audible.com. With over 180,000 titles to choose from, Audible.com allows you to listen to an immense library of books for every taste on your iPhone, Android, Kindle, tablet, or computer, including Resilient by Rick Hanson and Molly’s Game by Molly Bloom. Audible.com has a special offer for listeners of The Spark which includes a free audiobook of your choice and a 30-day free trial. Learn more and get your free audiobook now at thesparkpod.com/audible.